For those of you who have not been there, the Halal Guys is good enough to kill for (see 2006 stabbing incident ). It boasts long lines at all times of day. And the food is well worth the wait. Note: all carts are open until 5am on Friday and Saturday. Hour 1 corresponds to the hour between 12:00 and 1:00pm. Hour 17 is the hour between 4:00am and 5:00am. Note that the PPM numbers are for an average day. Weekends obviously have more customers and more plates of halal served at night than do weekdays. There is seasonality and other factors (huge demand on New Year’s Eve, Halloween, etc.) that also affect the number of plates served. My observations were made in October and November, fairly temperate months, and indicate a good baseline for an aggregate day of halal. In order to derive profit information I had to make some assumptions about the halal guy’s expenses. Since most halal carts are profitable selling their lamb and rice for $5, it follows that the actual cost of goods sold is less than $5 (even though the Halal Guys serve bigger plates and thus more food. See thisarticle, which estimates a 10% margin for DC food trucks). I assume cost per plate of $4.25, which includes all costs associated with producing a plate of halal besides staffing. I also assume a generous salary of $10 per hour for each employee and three employees per stand each operating hour. The results here are much higher than I expected. The Halal Guys serve over 1.34 million plates of halal per year for over $1.75 million in profit. Not to mention the 21.5% margin! 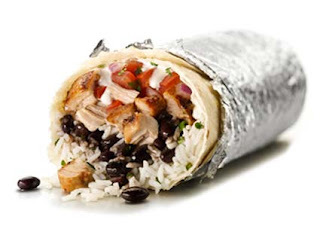 Valuing the Halal Guys now becomes easy (using Discounted Cashflow Analysis). The only assumptions left to make are the growth rate and the rate at which to discount future cashflows. Given that the Halal Guys have been increasing the number of carts in the area by about one every two to three years, a 5% per year is a fair and conservative estimate for growth. These companies are public and have high transparency. The Halal Guys ostensibly presents more risk to future cash flows, as there are many unknown factors in play (fights amongst the proprietors, disagreements with the city, etc.) they could just shut down shop; we don’t know what is going to happen. I am applying a 15% discount rate to account for this additional risks. The value of Halal Guys: $18,379,152. P.S. the red sauce is unreal. Willy Staley of theawl wrote an article this week title "A Conspiracy of Hogs: The McRib as Arbitrage." He points out the correlation between McDonald's introduction of the McRib and pork prices. 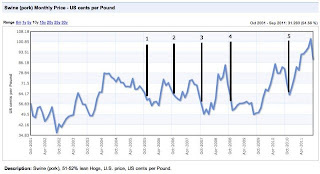 According to the Pork Cycle, supply and price of livestock is cyclical as changes in demand cannot easily be met due to gestation and breeding. Key: 1. November 2005 Farewell Tour; 2. November 2006 Farewell Tour II; 3. Late October 2007 Farewell Tour III; 4. October 2008 Reintroduction; 5. November 2010 Reintroduction. Live cattle shown in orange, lean hogs shown in white, and the spread is yellow. The same five events are market as previous key. During the five periods mentioned by Staley, a particularly wide spread exists between the two meats. There is a wide spread right now, as the McRib is being served. Thats six for six! Ostensibly the McRib cannibalizes demand for other purchases. Customers who buy the McRib are often switching from BigMacs. The two are comparable products. 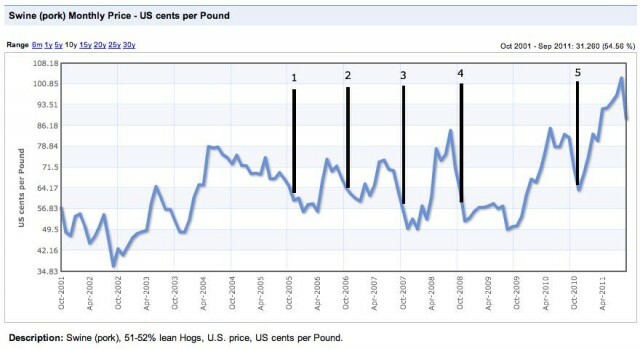 Introducing the McRib while pork is cheap and beef is expensive maximizes profit, improving margins. Watch the spread (not seasonality, or the price of pork!) to see when the McRib is coming back. I'd rather have a burrito.